Today we are launching a new blog from one of The Caley’s longstanding members, Anna Buxton. Anna was, until recently, the editor of Preview, The Caley’s twice-yearly news magazine. 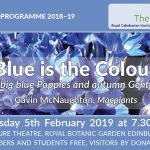 Anna has a lovely garden in Edinburgh and she will letting us know what is doing well (or maybe not so well), what is in bloom and things to look out for. 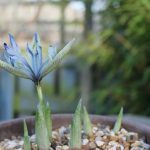 Anna’s blog will be published under the title “Tales from the Garden”. 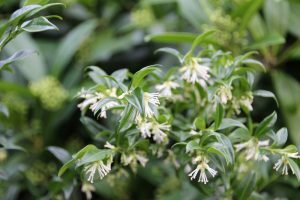 One of the uplifting aspects of January is the scent which often wafts round our Edinburgh garden. Between our back door and the busy road we have a large grouping of Mahonia japonica ‘Bealei’, Sarcococca confusa and Skimmia ‘Kew Green’. All these are very fragrant and in January it is the Mahonia and the Sarcococca which are spreading their scent, sometimes one predominates, sometimes the other and I can’t always tell which one I am smelling. 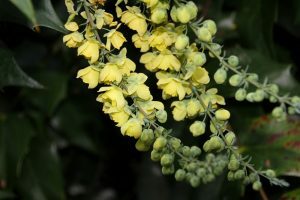 The Mahonia is vigorous and prickly and has to be controlled whereas Sarcococca, with its small shiny leaves, is a gentler creature and very useful for flower arranging. ‘Kew Green’ is a very good Skimmia and the flowers are visible in early January but they open a little later, and although by no means spectacular they too are beautifully scented. Like many Skimmias it is better in the shade as its leaves tend to yellow in bright light. Also in flower at the moment is Daphne bholua ‘Jacqueline Postill’. Unlike the others its scent doesn’t waft around and you have to get close to appreciate its subtle notes. It has an unusually upright habit and spreads by runners. 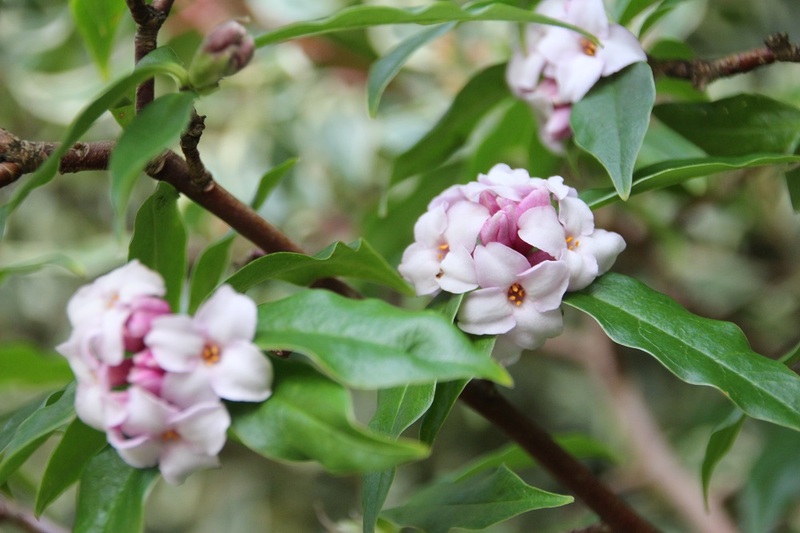 I saw Daphne bholua growing wild in Bhutan and it is extraordinary to think it flourishes here. By mid-January the witch hazel, or Hamamelis mollis, has become almost old hat it has been flowering for so long and the strange scent, which was quite strong earlier on, has faded.